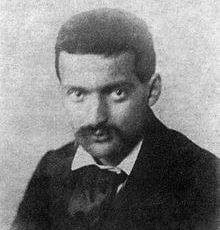 Paul Cézanne, who exhibited paintings rarely and lived progressively more in creative isolation, is considered nowadays as one of the greatest pioneers of modern art and painting, equally for the method that he evolved of putting down on canvas exactly what his eye saw in nature and for the qualities of form that he accomplished all the way through a unique dealing with space and color. The most significant influence on the work of his early maturity proved to be Camille Pissarro , an older but as yet unrecognized painter who lived with his large family in a rural area outside Paris. Camille Pissarro not only provided the moral encouragement that the insecure Cezanne required , but he also introduced him to the new impressionist technique for rendering outdoor light. Along with the painters Claude Monet, Pierre-Auguste Renoir, Paul Gauguin and a few others, Pissarro had developed a painting style that involved working outdoors (en plein air) rapidly and on a reduced scale, employing small touches of pure color, generally without the use of preparatory sketches or linear outlines. In such a manner Pissarro and the others hoped to capture the most transient natural effects as well as their own passing emotional states as the artists stood before nature. Under Pissarro's tutelage, and within a very short time during 1872-73, Cezanne shifted from dark tones to bright hues and began to c oncentrate on scenes of farmland and rural village. Although he seemed less technically accomplished than the other impressionist, Cezanne was accepted by the group and exhibited with them in 1874 and 1877. 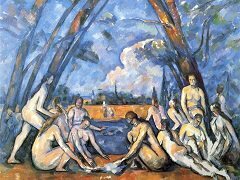 In general the impressionists did not have much commercial success, and Cezanne's works received the harshest critical commentary. He drifted away from many of his Parisian contacts during the late 1870s and 1880's and spent much of is time in his native Aix. 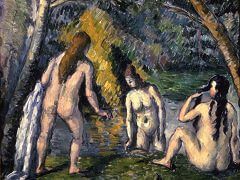 After 1882, he did not work closely again with Pissarro. 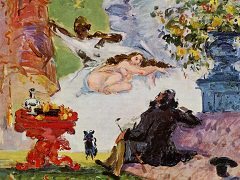 In 1886, Cezanne became embittered over what he took to be thinly disguised references to his own failures in one of Zola's novels. As a result he broke off relations with his oldest supporter. In the same year, he inherited his father's wealth and finally, at the age of 47, became financially independent, but socially he remained quote isolated. 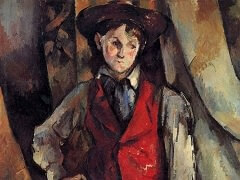 Cezanne's goal was, in his own mind, never fully attained. 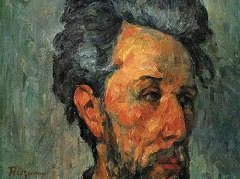 He left most of his works unfinished and destroyed may others. He complained of his failure at rendering the human figure, and indeed the great figural works of his last years - such as the Large Bathers - reveal curious distortions that seem to have been dictated by the rigor of the system of color modulation he imposed on his own representations. 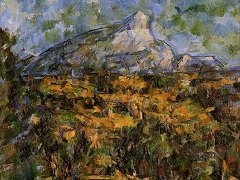 The succeeding generation of painter, however, eventually came to be receptive to nearly all of Cezanne's eccentricities. Cezanne's heirs felt that the naturalistic painting of Impressionism had become formularized, and a new and original style, however difficult it might be, was needed to return a sense of sincerity and commitment to modern art. For many years Cezanne was known only to his old impressionist colleagues and to a few younger radical post-impressionist artists, including the Dutch painter Vincent van Gogh and the French painter Paul Gauguin. In 1895, however, Ambroise Vollard, and ambitious Paris art dealer, arranged a show of Cezanne's works and over the next few years promoted them successfully. 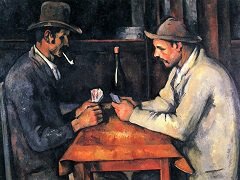 By 1904, Cezanne was featured in a major official exhibition, and by the time of his death (October,22, 1906) he had attained the status of a legendary figures. 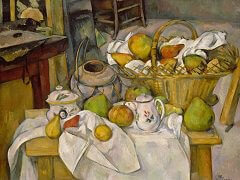 Cezanne forms the connection linking late 19th century Impressionism and early 20th century's new contour of Cubism. Henri Matisse and Picasso together recognize that "Cezanne is the father of all us." so that his contribution to modern art just can not be rejected.